Diamond Head is one of Oahu's most prestigious neighborhoods and a perfect place to enjoy serenity and tranquility while still being very close to the dining, shopping and exciting nightlife of Waikiki and downtown Honolulu. With beautiful beaches in a charming and elegant location you have everything you need for a wonderful Hawaii vacation on Oahu's sunny southern shore. From Diamond Head you can enjoy a leisurely stroll over to Waikiki to enjoy the beach, take a surfing or stand up paddling lesson, go for a ride in an outrigger canoe or choose from a whole variety of other fun activities available along the iconic beach. Browse the shops along Kalakaua and Kuhio Avenues and grab a bite to eat with ocean views. For a spectacular view of the southern shore hike to the top of nearby Diamond Head Crater, a short but strenuous trek that includes stairs and tunnels, finally rewarding you with sweeping vistas of Honolulu. There are many great beaches along Oahu's south shore including right in the Diamond Head area as well as along the Waikiki shoreline to the west and Hanauma Bay, Sandy Beach Park and Makapuu Beach to the east. Hanauma Bay is a great place for snorkeling with coral reef and a fascinating array of marine life in a sunken volcanic crater bordered by a large, sandy beach. This is a popular spot so go early to beat the crowds. For more great beaches drive up the windward shore to Waimanalo, and a bit farther to Kailua Bay which is great for a variety of ocean activities. Nearby is Lanikai Beach which many consider to be one of Hawaii's pretties beaches due to its powdery white sand, turquoise blue water and scenic views. Dining choices are plentiful in the Diamond Head area and close by are restaurants at Kahala Mall and more in Hawaii Kai. The Diamond Head Market & Grill sells a variety of gourmet foods and has a deli and bakery as well as freshly grilled fish that you can warm up back at your vacation rental. Head into Waikiki for hundreds of dining choices including seaside restaurants for memorable sunset dining. Downtown Honolulu also has abundant dining choices and a buzzing nightlife scene. Shopping in this area is excellent with close access to Waikiki as well as the Kahala Mall and the shops of the Hawaii Kai Towne Center. The Ala Moana Shopping Center has hundreds of shops and restaurants, and downtown Honolulu is also not far with many interesting stores to browse including the eclectic shops of the Chinatown district. Waikiki is lined with interesting shopping areas including the Waikiki Beach Walk with more than 50 shops. Another fun shopping area is the Royal Hawaiian Center right in the center of Waikiki. These are also great places to see local-style entertainment including hula performances and live music. A rental car is recommended when staying in Diamond Head vacation rentals so you can explore Honolulu's many sites and attractions as well as day trips to the north and windward shores. Diamond Head is within walking distance to serene and quiet beaches as well as the famed Waikiki Beach with everything you need for a day of Hawaii fun and relaxation. There are also taxis and some shuttles running in the Waikiki area, and most major populated areas of Oahu can also be reached on the public transit system known as "TheBus." The weather in Diamond Head is exceptional with very little rain and temperatures ranging from about 70 to 85 degrees F. throughout the year. Oahu's south and west shores are generally a bit warmer and drier than the north and east shores, and the winter months typically see more rain than summer. Sunny skies, mild temperatures and warm trade winds make Diamond Head an excellent vacation destination. Rain showers are typically brief and light with ample sunshine even on the rainier days. Ocean conditions vary each day though typically the south shore will have the calmest waters during the winter months while the north shore will have the calmest waters during the summer. Some beaches provide more protection from the open ocean, and if the waves are too big at the beach you visit then you may be able to find a more sheltered beach where water activities are safe. For swimming and ocean activities visit Oahu's lifeguarded beaches, obey all posted warnings and ask about the conditions on that day for the activities you choose. Diamond Head vacation rentals provide the optimal way to enjoy your Hawaii vacation with all the luxuries of resort living and all the comforts of home. Browse through our Diamond Head vacation home listings to get an understanding of the different amenities and property features we offer. 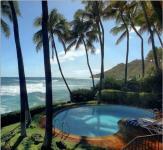 Our goal is to provide you with a with an unforgettable Diamond Head accommodation for your dream Hawaii vacation. We take pride in having the largest selection of high-quality vacation rentals on Oahu and we stand behind our product, making sure only the best of the best Diamond Head properties are listed on our site. If you have questions about our Diamond Head rentals or which Oahu destination is best for your vacation needs, please give us a call and we will be happy to assist you. To learn more about the history of the south shore follow the Waikiki Historical Trail which is marked with informational plaques on bronze surfboards. The self-guided tour begins at the Royal Hawaiian Center. 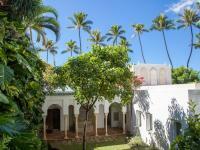 Numerous historical tours are offered in downtown Honolulu to explore the area's past including Iolani Palace and the Mission Houses Museum. Visit Bishop Museum to see ancient Hawaiian artifacts.